Many of these sets really coordinate nicely together. Do you recognize which sets she used??? Isn't that a great thank you card? She used the funky circle and thank you sentiment from Big Thanks. 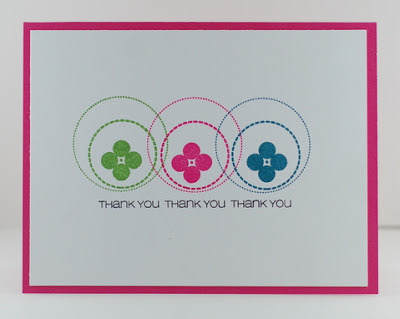 Then, she added the graphic flower from Truth Is right into the center of those funky circles! Look how great that looks together!! I just love how she die cut the numbers out, and the center of that zero is floating. So cool! I'm off to Napa with my hubby tomorrow morning for a quick getaway. So, any orders received after 3pm mountain time today will be shipped on Monday morning. Thanks for understanding and I hope you have a fabulous Wednesday! Happy Anniversary! 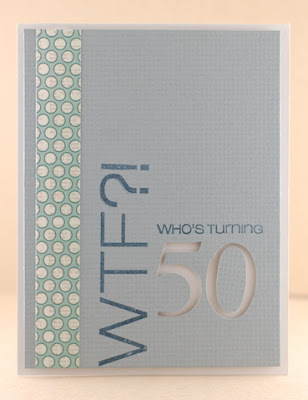 The WTF stamp set is next on my list to get!! Superb cards! Happy Anniversary! Great cards by Lynn! !